In a surprise announcement, it appears that the US will be normalizing relations with Cuba after decades of non-communication. This may be, from the libertarian standpoint, President Obama's single constructive act in a reign marked with wanton destruction and death. 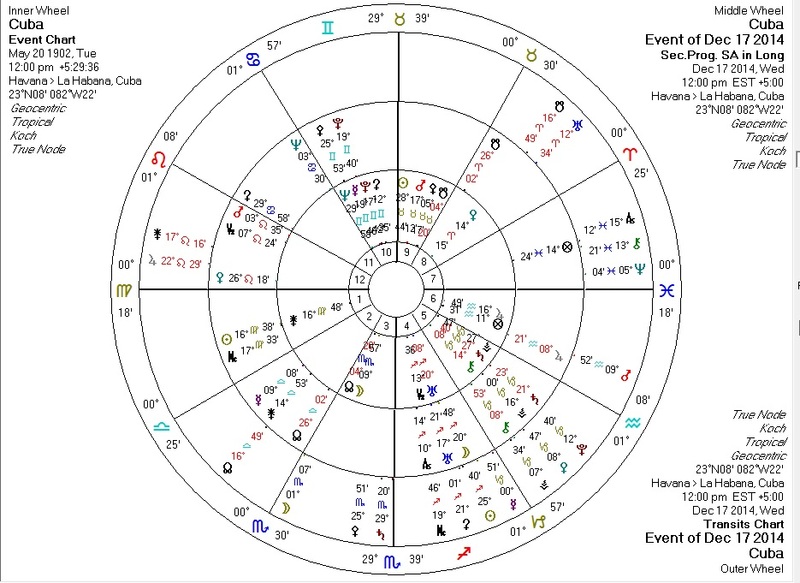 The current Uranus-Pluto square, approaching exact now, probably has some relevance to this event. 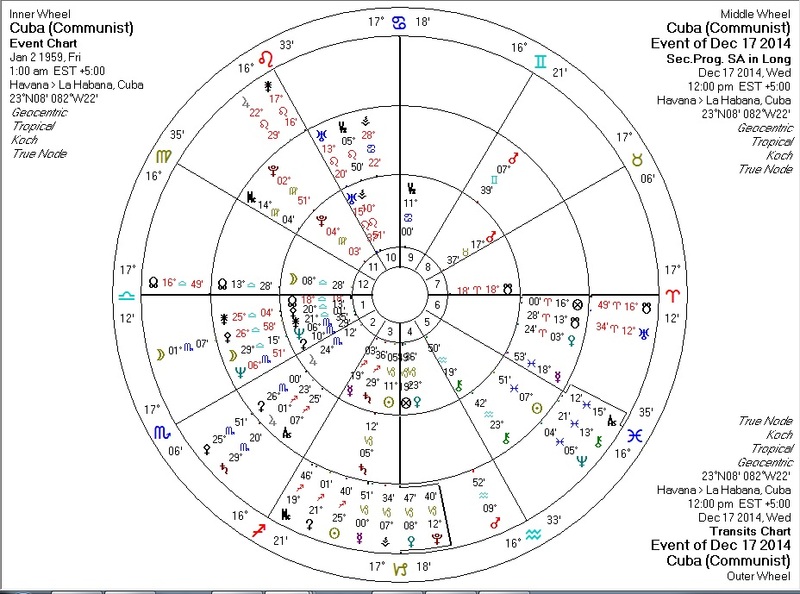 There will also no doubt be some interesting action against the composite charts between Cuba and the US and also transits which activate both charts which will be picked up by mainstream astrologers at some point. Readers of this blog know that the astrological driver for peace is Pallas and that the planetary goddess of wisdom and protector of civilization will be prominent in the relevant charts. 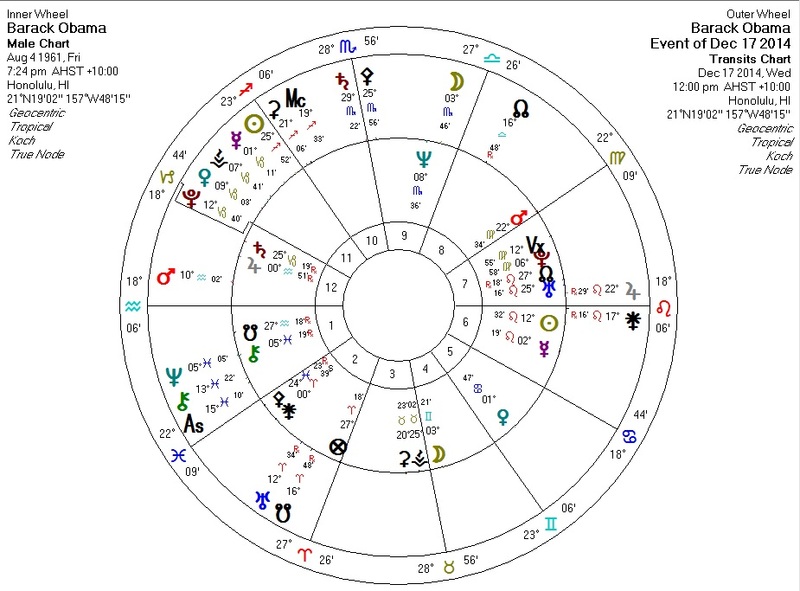 At this moment the Sun is exactly semisextile Pallas and semisquare her co-ruler Mars, providing for a day or so of sunshine in a period marred by anti-peace transits. Transiting Pallas at Obama's MC and trine his Pallas. Transiting Sun square his Pallas. Transiting Pallas square the US Pallas. Transiting Sun sextile US Pallas. Transiting Mercury quintile US progressed Pallas. 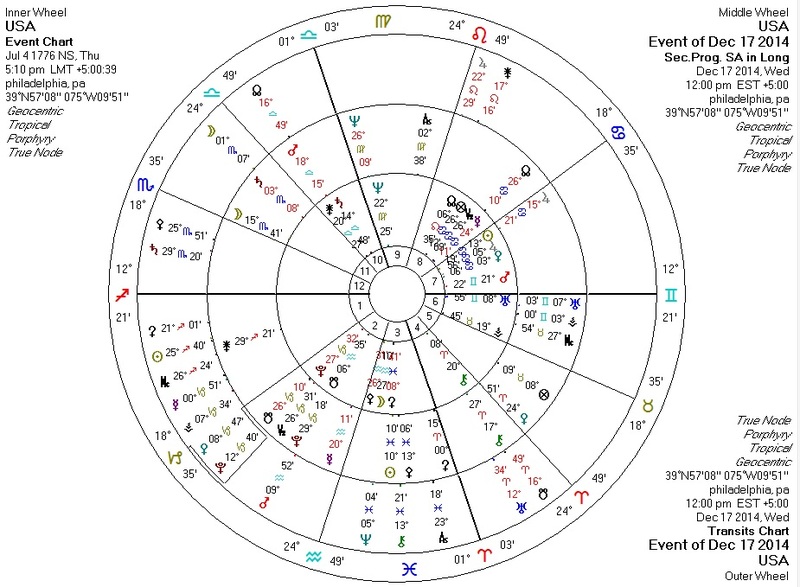 Against the Cuba independence chart, progressed Pallas is septile natal Pallas, transiting Pallas is quincunx progressed Pallas, and transiting Sun and Mercury are opposite progressed Pallas. Against the chart for Communist Cuba, transiting Pallas is semisextile natal Pallas and the Sun is sextile natal Pallas. For lovers of peace and freedom, Pallas is the most benefic of all the planets.